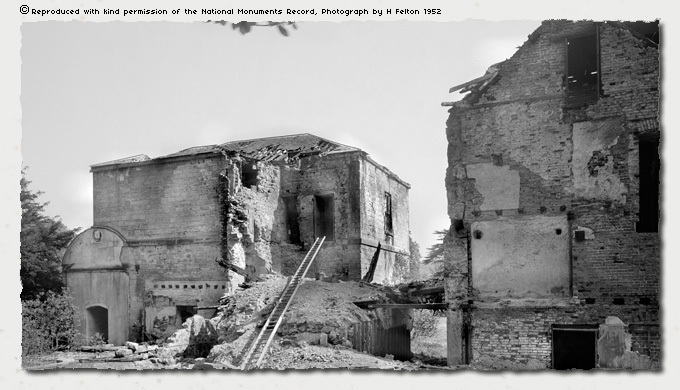 The final picture from H Felton's [NMR] photographs, is another view taken form the rear of the main elevation, looking directly at the rear of the Drawing Room. 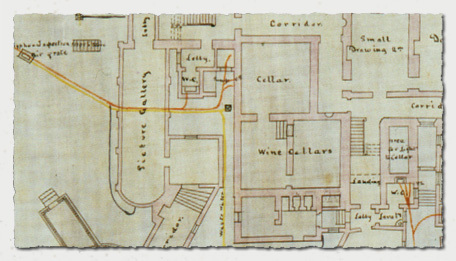 The centre foreground with the ladder in view is again the wine cellar area, to the left with a semi circular head is the entrance to the picture gallery. 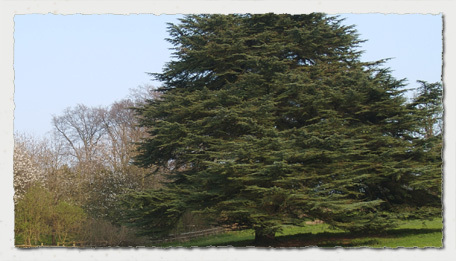 Between the two blocks can be seen the ends of the branches of the Cedar of Lebanon, which still dominates the landscape to this day. On the left of the main image, which is enlarged below, is the lobby leading through to the Drawing Room from the circular roofed Picture Gallery. 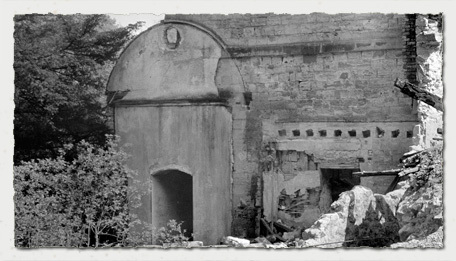 The Gallery was one of the last additions to the Hall, the semi circular profile of the glazed roof is clear on the remains of the stone coursed wall of the north elevation of the Drawing Room. It is even possible to make out the frieze course behind the plaster, a clear indication that the Gallery was added after the Drawing Room. The holes in the wall to the right of the Picture Gallery are the apertures for the ceiling/roof joists, to an attached room for a water closet [w.c.] clearly an add on, probably introduced as the development of sanitary building services improved in the latter part of the nineteenth century. But the drainage from the facility passes under the Gallery, thus pre-dating it. 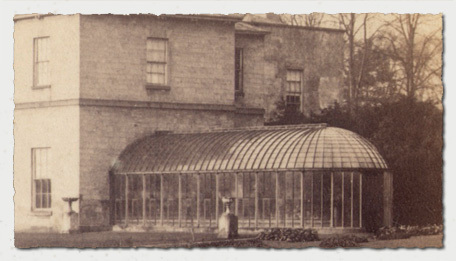 The two images below are dated about twenty years apart, the upper thought to be 1860's, the lower 1880's the curved roof can be seen in the lower picture and the light area of the gallery roof below the first floor window gives a hint that it was of glazed construction. Also the lack of window openings in the walls on the plan also hints to a glazed roof. The picture above is one of a new collection recently obtained which will be covered here in greater detail. 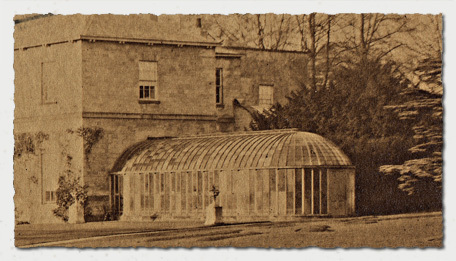 The set comprises a series of stereographic albumen images thought to date from around the 1860's. Although found on another part of the site the above is a small piece from a ceramic water cistern, found near the stables. The water closet at the rear of the Drawing Room was perhaps from this manufacturer. Although after reviewing the details of the Johnson Brothers [From www.thepotteries.org The Johnson Brothers began production at the Charles Street works in 1883 ] I think they were too late to have been the manufacturers of the earthenware used in this location. Also another consideration is the BS mark, which is beneath the ALLONS on the fragment B.S. 1125 . The British Standards were not introduced until 1901!